• Determine the level of dissolved oxygen in a sample of water using Winkler's method. • Analyze the effects of various factors on the level of dissolved oxygen in a water sample (e.g., salt content, temperature, degree of mixing, and the presence of reducing compounds). The level of dissolved oxygen in water is one of the most important parameters in determining its quality, because it indirectly indicates whether there is some kind of pollution. Common processes that pollute surface waters include the discharge of organic matter derived from municipal sewage or industrial wastes, and runoff from agricultural lots and livestock feedlots. In addition, the release of warm or hot discharges from industrial cooling towers induces what is known as thermal pollution. Such discharges directly affect the level of dissolved oxygen in water bodies, which is crucial for the survival of aerobic organisms and aquatic fauna such as fish; in fact, excessive pollution has caused massive fish deaths. In the long run, the discharges of organics or of nutrients favor the accelerated eutrophication or productivity process with algal blooms. As a consequence, there will be a lowering of the dissolved oxygen content (or DO level) and the "death" of the aquatic system. (See Section 8.4.2). The measurement of the DO is also important to determine whether a water system is predominantly aerobic or anaerobic, predict the survival of aquatic organisms, and predict whether aerobic biological processes can take place for transforming the biodegradable organic contaminants discharged in water. When there is an organic discharge, the DO decreases rapidly due to the action of the aerobic microorganisms that consume oxygen during the metabolic degradation of organic matter (see Chapter 7). Consequently, the presence of dissolved oxygen is critical for the self-cleansing of the water system, and in combination with the presence of CO2, it is also critical for the determination of the corrosive character of water on materials such as iron and other metals. The DO depends on water temperature, dissolved salts, atmospheric pressure (and therefore of altitude), the presence of reducing compounds, suspended matter, and living species. The aquatic flora and fauna can contribute to the consumption or to the production of oxygen in water. 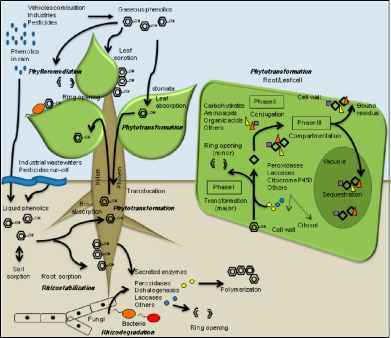 For the aquatic flora, the photosynthesis process is responsible for the generation of oxygen in the presence of light; this explains the DO fluctuations during the day/night cycles and in the different seasons. The presence of microorganisms and biodégradation processes affect the DO level as well. This can also vary vertically, decreasing in the water column in lakes, large deep rivers, or the ocean due to stratification. By contrast, in rivers and streams it can vary horizontally along the course of the river flow, increasing where there are waterfalls or rapids, and decreasing in the slow-moving portions of the river and in those with organic discharges or microbial activity. Since the dissolution of air in water is an interface mass-transfer phenomenon, the degree of contact and of mixing with water is also important. Henry's constant for dilute solutions may approach the real equilibrium constant for the dissolution reaction; however, as the ionic strength of the solution increases, this is no longer correct, and activities or effective concentrations must substitute concentrations in the equilibrium ratio. Since oxygen is a non-electrolyte, it undergoes a salting-out effect where the water molecules bind to salts, reducing the solubility of the gas. One of the two common methods for measuring the DO in water involves an amperometric method based on a selective electrode for oxygen, which is the most direct type of measurement. The other, more traditional method involves a volumetric titration—it is known as Winkler's method and consists in the oxidation of Mn2+ ions by the dis solved oxygen under basic conditions. This step of the reaction is called the oxygen-fixation. If there is no oxygen present, this step generates a white precipitate of Mn(OH)2; if there is oxygen present, a brown precipitate of MnO(OH)2 and Mn02 is formed. This precipitate is dissolved with an acid, and when iodide ions are present, they are oxidized to molecular iodine, I2, which gives a brownish color to the solution. The amount of liberated iodine is directly related to the amount of dissolved oxygen. This iodine is titrated with a standardized sodium thiosulfate solution, using a starch indicator for the endpoint. The presence of nitrites can interfere and affect the results noticeably; however, if sodium azide is added, it transforms the nitrites into N2 and N20. The addition of azide is known as the modified Winkler method. In this experiment, students will take several samples of water—some of them saturated with air— and measure the DO using Winkler's method, in a semi micro scale adapted from an original method proposed by Ondrus (see Ondrus, 1993). Because the mixing of reactants must be done without introducing additional air to the sample, a 10-mL syringe is used (instead of a standard DBO bottle). In this way, the sampling, the addition of reactants, and the reaction all take place in the syringe. Another option is to use a small vial of known volume, equipped with a septum seal, and add the reactants to it with a syringe. At the end, the sample is deposited in a small Erlenmeyer flask and titrated to the endpoint. The temperature, the mixing and salt content of a water sample are to be modified as well, so as to allow visualization of the factors that affect the dissolution and the concentration of oxygen in water. Finally, to observe the depletion of oxygen by the addition of a reducing compound, one can measure the DO before and after reaction with a reducing agent. The DO is measured with the same method described above or with the selective electrode method. Sulfuric acid is corrosive and contact with the skin or eyes must be avoided. All the residues generated in this experiment must be disposed of in a special container identified for that purpose. Before proceeding with the experiment, obtain the value of the current barometric pressure. Note: An incorrect sampling process in natural waters can alter the results considerably due to the in troduction of extra-dissolved oxygen. In order to sample correctly, take the sampling bottle or vial with a gloved hand and introduce it slowly and horizontally down the water surface to the height of the sampling site. Rinse the bottle with water under the surface, then fill it completely and cap it inside the water or immediately after it reaches the surface; make sure that there are no air bubbles trapped inside. If samples from deeper levels are needed, a special sampler must be used. 1. Place approximately 50 mL of D.I. water in a 100-mL beaker and saturate it with air by aeration with an air pump through a diffuser, for at least 20 minutes. Write down the ambient temperature. 2. In the meantime, apply Winkler's method to a tap water sample. This technique will be used throughout the experiment, with all samples. 3. After aeration, determine the D.O. level in the saturated D.I. sample using the same technique. 1. 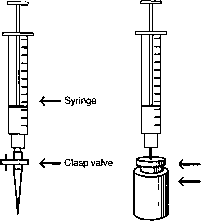 Rinse the 10-mL syringe prepared as shown in Figure 1 by pulling the plunger and slowly drawing approximately 2 mL of the water sample. Then, turn the syringe upwards and tap the body of the syringe softly so as to liberate the small bubbles on the surface of the plastic material. Figure 1. Adapted syringe or vial for reaction. Let them buoy to the tip and press the plunger to release them from the syringe. Now turn the syringe downwards and slowly push the plunger to expel the entire sample. This procedure will leave a small amount of water filling the tip of the syringe. If the plunger is then softly pushed further, a small drop of water will form at the tip of the syringe. 2. Now take approximately 6 mL of the target water by introducing the tip of the syringe deep inside the water sample in the beaker, and slowly pulling out the plunger. No visible air bubbles, except those of the sample, must be contained in the syringe. 3. Next, incline the syringe tip upwards and slowly push the plunger in, so as to expel the necessary volume and leave exactly 5 mL of sample inside. If a vial is used instead of the syringe, fill it to capacity (record the exact volume added), and seal it with a septum. a. Draw 0.5 mL of the manganese sulfate solution into the syringe or vial (hereafter called the reaction chamber). Take care not to introduce more than what is specified, because once the solution is inside, it cannot be taken out. If you use a syringe, close its tip using a septum, or by either bending or clasping tightly a piece of tubing attached to the tip. If you use a vial, introduce the reactant with the syringe. In either case, after that, shake the system up and down several times to mix the contents well. b. Draw 0.5 mL of the alkaline iodide-azide solution into the syringe or vial in the same manner as in the previous step. The plunger tip must now be at the 6 mL mark. Once more close the tip of the syringe and mix thoroughly as mentioned above (i.e., allow it to react mixing the contents by shaking the reaction chamber up and down at least 10 times or for 1 or 2 minutes). Observe the kind of precipitate formed. If it is cloudy-brownish, this signals the presence of manganese hydroxide (III), which also indicates that there is dissolved oxygen present. If it is a cloudy-white precipitate, then this means that no dissolved oxygen is present. c. Carefully draw 2-3 mL of 0.018 M sulfuric acid into the reaction chamber in the same manner described above. Shake the entire reaction mixture carefully but thoroughly until the precipitate dissolves in the acid medium. If a small residue of precipitate remains, add a very small amount of extra acid so as to dissolve it. (Note: After adding sulfuric acid, the presence of air in contact with the sample will not affect the results). The color of the final solution (from pale yellow to brown) will depend on the amount of dissolved oxygen initially present in the sample. The darker the color, the higher the amount of initial oxygen dissolved. A brown color reflects the presence of 1° (in the form of Ij). Once the reaction is complete (i.e., the precipitate is dissolved), dispense the content of the syringe into a clean, 50-mL Erlenmeyer flask. Use 3-5 mL of D.I. water to rinse the body of the syringe and add it to the sample in the flask. Fill a microburet with the 0.00025 M Na2S203 solution and titrate the iodine in the sample (liberated as 1^) to a yellowish color. Then add two to three drops of starch indicator. A green to blue color must develop. Softly, swirl the Erlenmeyer flask and continue titrating slowly to a colorless endpoint. Record the total volume of titrant used. Take a sample of 20 mL of the aerated D.I. water, place in a beaker, and with a thin spatula add a very small amount of a reducing agent, that is, sodium sulfite or sodium metabisulfite, and a small crystal of cobalt (II) chloride as catalyst. Let the mixture react, then take a filtered sample of the treated water and apply the same technique as before to measure the dissolved oxygen. Observe the result after the reducing treatment, and compare it with the D.O. of the original sample (i.e., aerated D.I. water). Prepare three different samples of D.I. water of 50 mL each in a beaker, and place them in different temperature baths: for example, (a) one in an ice bath (~4°C), (b) a second one at 40°C and, (c) another at 80°C. These last two may be prepared in a sand bath, each at different temperature. With the air pump let air bubble into the separate samples in their corresponding baths, for at least 10 minutes each. After this, determine the temperature, take a sample of each, and measure the dissolved oxygen level using the modified Winkler technique. Because the ionic strength or salt content will affect the dissolved oxygen level, prepare 100 mL of a blank solution containing 50 g/L of NaCl. Prepare three beakers: (1) in one beaker, put 50 mL of the blank solution; (2) in a 50-mL volumetric flask, dilute 30 mL of the blank solution to 50 mL; (3) prepare another 50 mL in a volumetric flask with 15 mL of the blank solution diluted with D.I. water. Place each solution in a beaker and saturate with air for at least 15 minutes, and then take a sample and measure the D.O. with the same modified Winkler method. 1. Carry out the measurement of dissolved oxygen with the modified Winkler technique of a river or lake surface water sample. The most reliable results are obtained if the sample is processed and the dissolved oxygen is fixed through the first two reactions of the Winkler method at the site of sampling, after which the processed sample is carefully transported to the laboratory for the titration process (three samples for more reliability). The sampling may be done with a vial or directly with the syringe. That is, carry out the first three steps of the Winkler technique, and leave the titration step for the laboratory. 2. Take another surface water sample at the same site and this time do not fix the oxygen (i.e., do not add any reactants); only take care to cap the sample well until it is measured in the laboratory. Then, take the capped sample to the laboratory and carry out the Winkler technique as specified. After doing this, you will see the difference in the measurements on site and off site.